What happens the next moment after you die? It depends upon whether you are a believer or an unbeliever, and the differences are great. Every one of us has an appointment we must keep, even after birth, we’re on our way to death, but the problem is, we don’t always know when that appointment is. I am speaking about Hebrews 9:27 which says that “just as it is appointed for man to die once, and after that comes judgment.” We know that we have a day appointed to us for the day of our death, and we also know that judgment comes after death, but in a sense, if we have repented and trusted in Christ, our judgment has already occurred, and that’s in Christ Jesus Who took the wrath of God that we deserved. When we trust in Christ, we instantly receive eternal life. Jesus said, “I am the resurrection and the life. Whoever believes in me, though he die, yet shall he live, and everyone who lives and believes in me shall never die. Do you believe this” (John 11:25-26)? Solomon understood how things work, writing, there is “a time to be born, and a time to die; a time to plant, and a time to pluck up what is planted” (Eccl 3:2), so the fact that there is a time for us to be born but also a time for us to die is Scriptural. What we don’t know is when that day will be, but we know it is coming, or if Christ returns before we pass from this earth, we won’t have to worry about death anymore (Rev 21:4), however, “we must all appear before the judgment seat of Christ, so that each one may receive what is due for what he has done in the body, whether good or evil” (2nd Cor 5:10). One group of scientists have actually addressed the question of what happens after death, but their answer is so fluid that it’s like trying to nail Jell-O to the wall…it just doesn’t work. They stated, “There’s only one group of people who really know what happens when you die: the dead. And since the dead won’t be revealing their secrets anytime soon, it’s up to scientists to explain what happens when a person dies.”  Sorry, but it’s not up to scientists to explain what happens after death because the answer won’t be found in a beaker or in a scientific experiment. It is a one way trip, and there’s no coming back. All of the hundreds of near-death experiences (NDEs) are impossible to verify, and they are so different from one another, that their stories cannot be used to reach conclusions. Many report seeing a bright light, however, most scientists will tell you that these NDE’s are what they call, “lucid dreaming,” that happens in a dead body, and can be due to oxygen deprivation. It doesn’t take a scientist to explain that being human is 100% fatal, because 10 out of every 10 people will die. Those are some pretty alarming statistics, so no one is exempt. The old Chinese proverb puts it well: “After the game, the pawn and the king go into the same box,” and how true that is. Death does not discriminate by income, color of skin, or ethnic origin. When the rich man went to Hades and the poor man went to the bosom of Abraham, which is symbolic of Paradise, there was no mention of an intermediary amount of time (Luke 16). From the very first moment, the rich man was in torment from the flames and was in a conscious state, knowing thirst, feeling heat, and having regret, however, Lazarus was instantly in Paradise and had no lack. It was apparently instant arrivals for both the rich man and Lazarus, just as the Apostle Paul indicated, writing that “we are of good courage, and we would rather be away from the body and at home with the Lord” (2nd Cor 5:8). 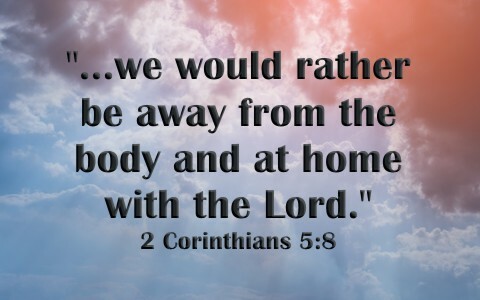 If you’re in the body, you’re away from the Lord’s literal presence, however to be away from the body (dead), is to be “at home with the Lord,” something he has said earlier (2nd Cor 5:6), so Paul was confident that after death, or being away from his physical body at death, he would be at home with the Lord, and we presume that is heaven, or some say, Paradise until the kingdom is consummated here on earth, so at Christ’s return, the true Paradise will be the New Jerusalem, or the Kingdom of God, physically established here on the earth (Rev 21:1-4). The myth of soul sleep just doesn’t hold up in Scripture. To cite one or two verses, and to use them out of context, is not enough to just say that the dead are sleeping. Yes, that’s the way Jesus described death, but Lazarus was not in a soul-sleep, just as Lazarus after death wasn’t soul-sleeping but was in Abraham’s bosom, or Paradise. Jesus told the thief on the cross, “Truly, I say to you, today you will be with me in paradise,” (Luke 23:43), showing that the very same day the thief on the cross died, was the very same day he’d be in Paradise (after death), and be there with Jesus! Daniel the Prophet, in writing about the last days, wrote, “And many of those who sleep in the dust of the earth shall awake, some to everlasting life, and some to shame and everlasting contempt” (Dan 12:2), and is amazingly similar to the Apostle John’s writing about a great white throne judgment (Rev 20:12), where “the dead were judged by what was written in the books, according to what they had done. And the sea gave up the dead who were in it, Death and Hades gave up the dead who were in them, and they were judged, each one of them, according to what they had done. Then Death and Hades were thrown into the lake of fire. This is the second death, the lake of fire. And if anyone’s name was not found written in the book of life, he was thrown into the lake of fire” (Rev 20:13-15). It is only after Christ’s return to judge the lost that they are eventually cast into the lake of fire, so this hasn’t happened yet, although those who reject Christ and then die are certainly in great torment, but to what extent, we don’t exactly know. Apparently, there is a temporary hell (Hades) and heaven (Paradise) before Christ’s final judgment of mankind, and the temporary holding place for the lost is Hades. It’s like they’re in jail, after having been convicted, and now they’re awaiting their final sentencing (Rev 20:12-25; 21:8), but when a believer dies before Christ’s return, Paradise is their place, and that would obviously mean, being in the presence of the Lord. There is no soul sleep after death, but an immediate recognition of a person’s fate. The rich man in Hades didn’t wonder where he was at or why, and Abraham reminded him that there was no way he could go back and warn his family. It’s a one-way trip. If you are not saved, then you are one heartbeat or one accident or one stroke away from either being in torment in Hades or in Paradise and experiencing the presence of the Lord. There are no other options. If you have been moved by this article, please think about putting your trust in Christ. Don’t put it in science, because they really don’t know. Jesus knows, and He’s told us, so today, take His advice; “unless you repent, you will all likewise perish” (Luke 13:3). More reading on this topic: Do Christians Go Immediately to Heaven After They Die? Resource – Scripture quotations are from The Holy Bible, English Standard Version® (ESV®), Crossway Bibles. (2007). ESV: Study Bible : English standard version. Wheaton, Ill: Crossway Bibles. Used by permission. All rights reserved. Live Science. “What Happens When You Die?” Elizabeth Palermo. https://www.livescience.com/42955-what-happens-when-you-die.html (Accessed Weds. July 6, 2017). I appreciated this article. Thank you. What you’re saying is: since my father in law is dead (a christian in life), he is in paradise, but not heaven? When will he be in heaven? What is he doing there? Is he young or old (he died at 78)? Will we, as christians, see Satan and the unbelievers being thrown into the lake of fire? I read and like your Rhetorical Jesus!! It is true that salvation is “not by works of righteousness which we have done” (Titus 3:5). “will render to each one according to his deeds”: eternal life to those who by patient continuance in doing good seek for glory, honor, and immortality; but to those who are self-seeking and do not obey the truth, but obey unrighteousness-indignation and wrath, tribulation and anguish, on every soul of man who does evil, of the Jew first and also of the Greek; but glory, honor, and peace to everyone who works what is good, to the Jew first and also to the Greek. (Romans 2:6-10). To those who do not OBEY the truth = hell. For we must all appear before the judgment seat of Christ, that each one may receive the things DONE in the body, according to what he has DONE, whether good or bad. (2 Corinthians 5:10). Notice the “works” are being tested for what kind of works are they — those done for the glory of Christ (gold, silver, precious stones) will withstand the fire while those not done to the glory of Christ (wood, hay and stubble) “shall be burned”. They are all being tested so “he shall receive a reward”. HOWEVER even “If any man’s work shall be burned, he shall suffer loss [OF REWARDS]: but he himself shall be SAVED”. If you are a Christian death is the great doorway which you walk through to heven,so many people who say they are Christians react the same way to death as the world does. There are several problems with this explanation. Briefly, Revelation 2:7 places the tree of life in the midst of the paradise of God, would this not be THE paradise of God and not a temporary “holding place”? Ecclesiastes 9:9 states that the dead “know not anything”. The rich man and Lazarus must be a parable and not literal event because Lazarus said nothing of being in paradise, or anything at all about where he was while dead. When Jesus told Martha that her brother would rise again, she did not believe that Lazarus was in paradise, she said “I know that he shall rise again in the resurrection AT THE LAST DAY”. If Jesus wanted to comfort Martha, would it not be of greater comfort to tell her that Lazarus was now in paradise? 1 Timothy 6:15,16 states that only God has immortality. 1 Corinthians 15:53,54 says that we will receive immortality at the last trump, we don’t have it now. Besides why would Jesus need to come back for us if we are already there with him immediately when we die? Thank you Mr. Morgan. Ecclesiastes is written with a world view in many places. It is somewhat cynical, until he reached the conclusion which is obey God. There is the immediate being with the Lord, as Paul said to be absent from the body is to be present with the Lord, and the body is raised to be joined with the spirits of those now deceased. If we do not have eternal life right, how could Jesus say that whoever believes in me has eternal life (Grk, present possession). Jesus did comfort Martha…but Martha didn’t get it. Even the disciples said, “Lord, if he sick, let him sleep, ,but Jesus said plainly, “He is dead” but not out of existence. God is the God of the living…of Abraham, Isaac, and Jacob, and all who trust in Him but die. When Jesus died on the cross, He didn’t enter “soul sleep” but never ceased to exist since He is God and humans after birth have an immortal soul so there are the bodily resurrections of the dead (Dan 12:2-3; Rev 20:12-15) but their souls of the lost are presently separated from God and have full conscience. If Lazarus and the rich man were a parable, it would be the only parable that He used a name for. I believe it is an account of what happens after death because that was the context of these verses. Thank you but we can agree to disagree. Just be glad we are saved….the details of what happens after death matter little to the living who still haven’t trusted in Christ. Let that be our priority and not wrangling over non-essential to salvation issues. Thank you for this article Jack. This has shed light and confirm on the beliefs i have regarding death, temporary hell and heaven and the final judgment. And leaves me to get more serious about the journey i have with Christ. Previous post: Why Don’t The Jews Believe In Jesus? Next post: What Are Modern Day Idols Christians Can Worship?